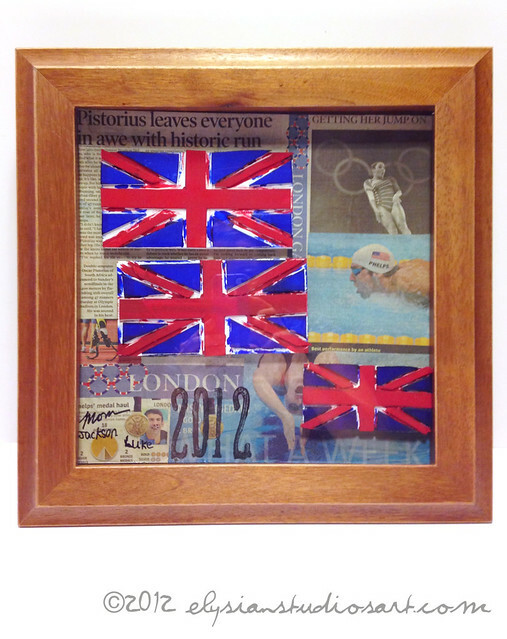 Another Olympic Games has come and gone, but you can still capture the memories, and display your Olympic Spirit proudly in a shadowbox frame. 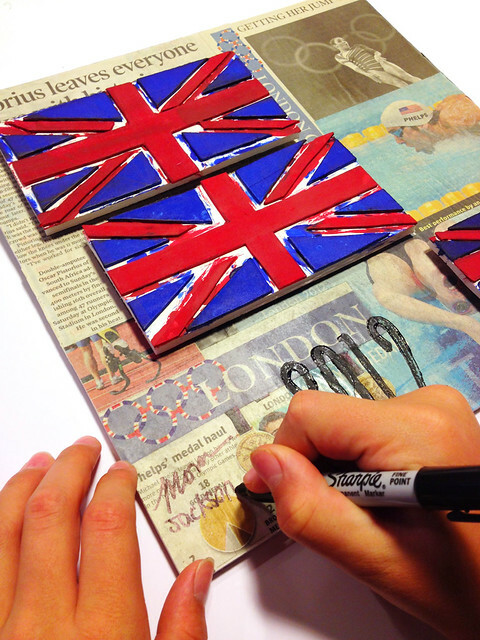 your handmade Union Jack Flag Stamps have created some awesome souvenirs! 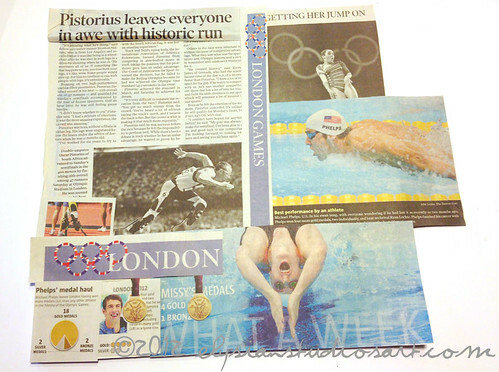 Now you can display your treasured stamps alongside headlines from the games so your family can remember for years to come. The best part? 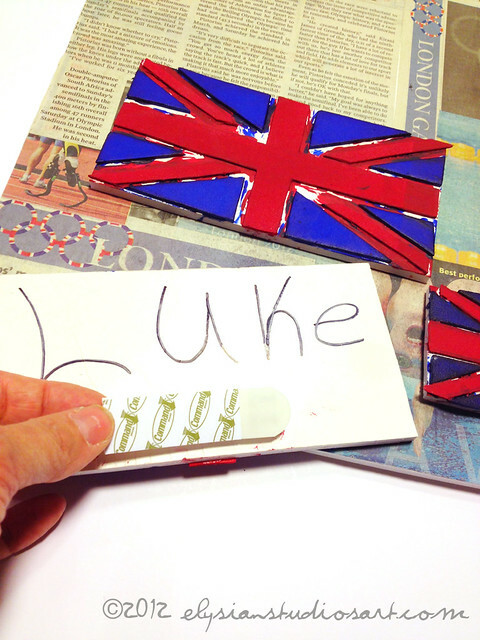 I'll show you how to make your stamps removable, so you can use them for future projects! 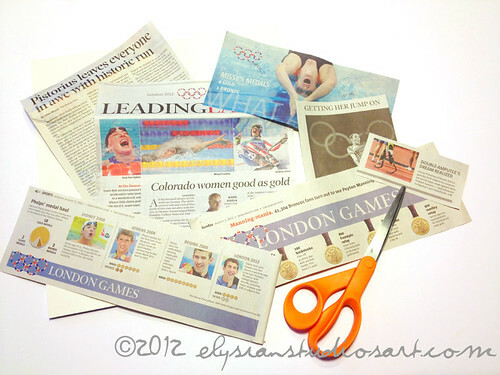 Sort through your magazines or newspapers, and trim out photos and headlines that remind you of your favorite moments from the Olympic Games. 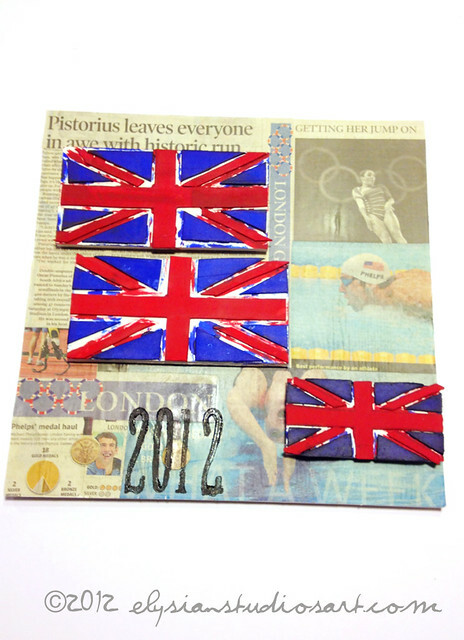 Be sure to include adequate text, as your Union Jack Stamp will cover up part of your images. Begin to arrange your images on the pre-cut foam core. Let the images extend a bit beyond the edges, and make sure all parts of the board are covered with either text or images. Then carefully move the images to the side and prepare to glue them down. Pour a generous amount of glue onto the paper plate. Paint an even, thin coat of glue onto the foam core, lay your first image down, then paint another even, thin coat of glue on top. Continue until all of the foam core has been covered. 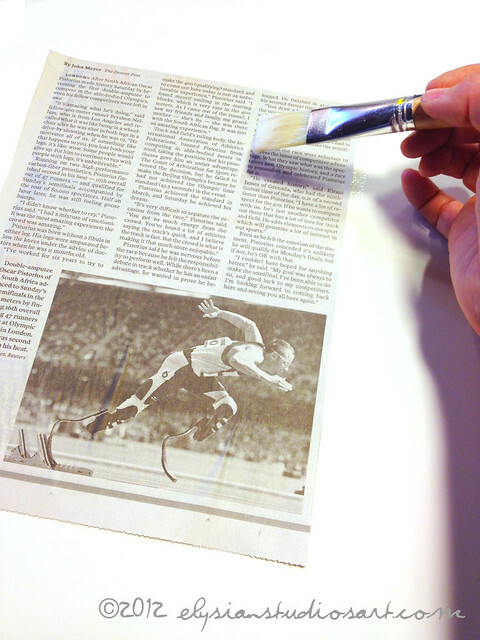 Your paper may wrinkle, but if you have put the glue on evenly, it usually flattens as it dries. If you end up with a wrinkle, it is OK! This is how my piece looked when it was completely glued. See how many wrinkles are there? Almost all of them went away once the piece dried. I confess, I ended up with one good wrinkle, and it was probably because I pulled up the image and moved it after I applied the glue. You may notice more wrinkles or shiny spots in the tutorial photos from this point on, and that is because I had to keep going even though the background wasn't completely dry. Don't worry- your collage will look amazing! 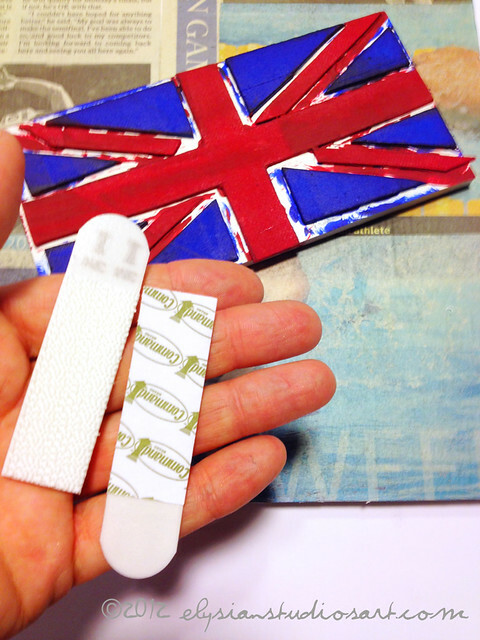 Once the glue has completely dried, trim off the excess with a craft knife. 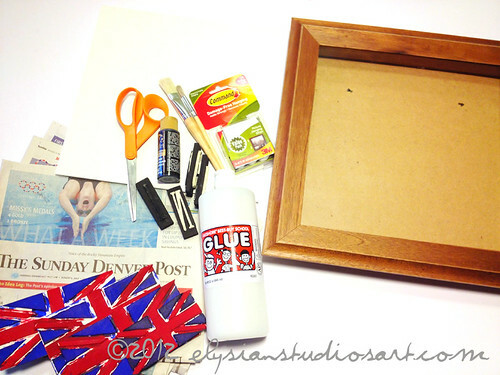 Now get ready to embellish your collage! Determine how many of your stamps will fit on your collage, and where they will be placed. Place two parts of one 3M Command Strip together, and adhere it in the center of your first stamp. Remove the second backing on the strip and adhere it to the collage. Repeat this process for the other stamps. 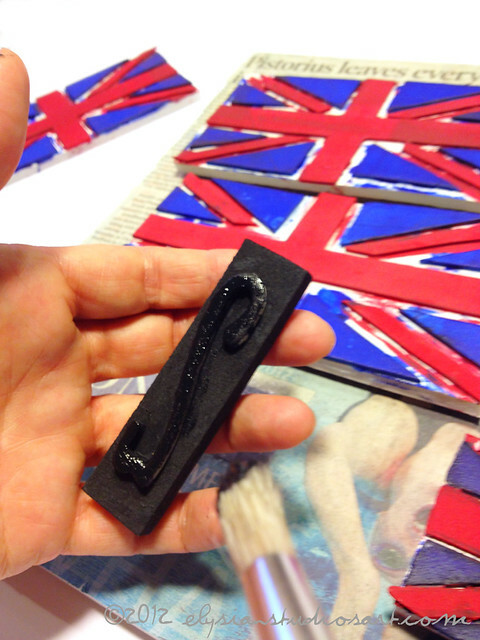 Now if you ever get the urge to stamp more Union Jack Projects, you can easily remove and replace it! Enhance your collage a bit further by adding some stamped text. Using the foam stamps, determine what you would like to say. Generously load your stamp with black paint (or your chosen color). I prefer to start from the end of my phrase and then work backwards. I stamped "2012", so I started with the "2" on the far right. Press evenly and firmly on your stamp, then lift it directly up and off of the collage. Continue until your entire phrase has been stamped. If your family was involved in crafting the stamps, or making some of the projects with them, have everyone add their signature to the collage. This is a great way to capture the age of your children at this moment in time. Their signatures today will look quite different in ten years! 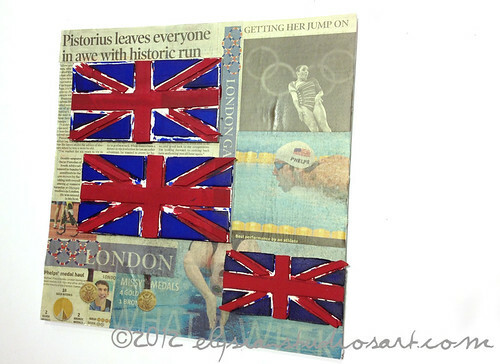 Place the completed collage in your frame and hang it on the wall to enjoy for years to come! 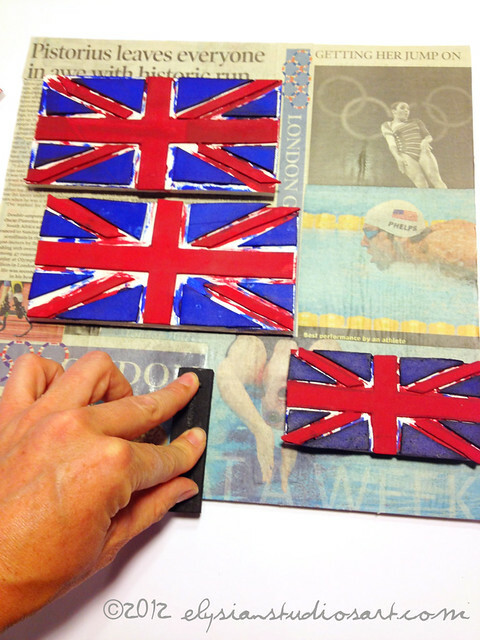 I hope you had a wonderful time watching the London 2012 Summer Olympics, and I hope you enjoyed this crafting series featuring the Handmade Union Jack Stamp. If you missed the earlier projects, click here. 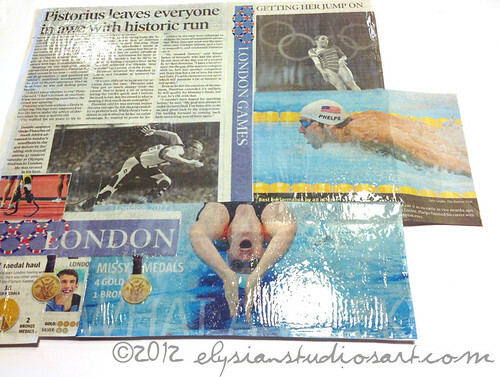 What were your favorite Olympic Memories? Which athletes had the stories that inspired you most? 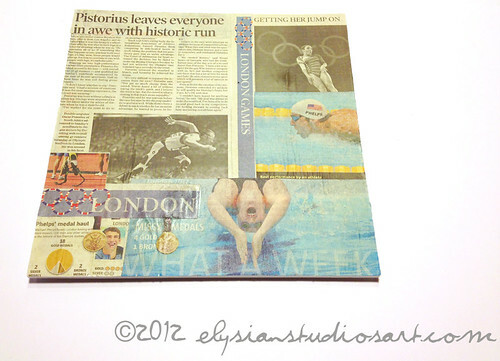 We are a big fan of South African runner, Oscar Pistorius, and our hometown favorite, Missy Franklin. Both are heroes in our book! I really love the way you've used your handmade stamps as art. What a great idea! Thank you very much, Michele! Since we made these stamps together as a family and then used them for so many projects, it is nice to be able to view the stamp itself on a regular basis!